Arthrobacter nitroguajacolicus Rü61a is able to utilize the N-heteroaromatic compound quinaldine (2-methylquinoline) as sole source of carbon and energy (Hund et al. 1990; for a review, see Fetzner 1998b). 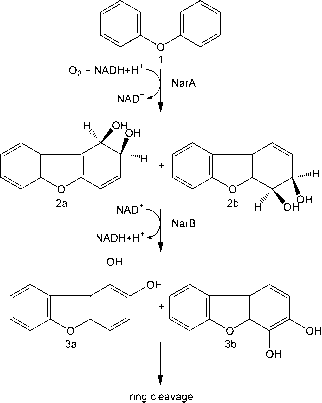 Quinaldine degradation (Fig. 10) starts with a hydroxylation in position 4 to form 1H-4-oxoquinaldine, catalyzed by the molybdenum enzyme quinaldine 4-oxidase (Qox) (Parschat et al. 2003). A monooxygenase-catalyzed hydroxylation at C-3 subsequently produces 1H-3-hydroxy-4-oxoquinaldine, which undergoes an unusual 2,4-dioxygenolytic ring cleavage reaction, yielding carbon monoxide and N-acetylanthranilate (Frerichs-Deeken et al. 2004; Frerichs-Deeken and Fetzner 2005). N-acetylanthranilate is hydrolyzed to anthranilate and acetate by an aryl-acylamidase (Amq) (Kolkenbrock et al. 2006). Note that the genes coding for the enzymes of this pathway module are not related to genes involved in the activation and ring cleavage of aromatic compounds (Parschat et al. 2003). Fig. 10 Quinaldine degradation to anthranilate by A. nitroguajacolicus Rü61a (Hund et al. 1990; Fetzner 1998b; Overhage et al. 2005; Parschat et al. 2007). 1, Quinaldine (2-methylquinoline); 2, 1H-4-oxoquinaldine; 3, 1H-3-hydroxy-4-oxoquinaldine; 4, N-acetylanthranilic acid; 5, anthranilic acid. Qox, quinaldine 4-oxidase; Moq, 1H-4-oxoquinaldine 3-monooxygenase; Hod, 1H-3-hydroxy-4-oxoquinaldine 2,4-dioxygenase; Amq, N-acetylanthranilate amide hydrolase probably is chromosomally encoded. Five other quinaldine degrading strains, which all turned out to belong to the genus Arthrobacter, were isolated from soil samples by enrichment on quinaldine. Four out of these five isolates contained a pAL1-like linear plasmid carrying genes coding for quinaldine conversion, suggesting horizontal dissemination of this replicon among the genus Arthrobacter (Overhage et al. 2005).